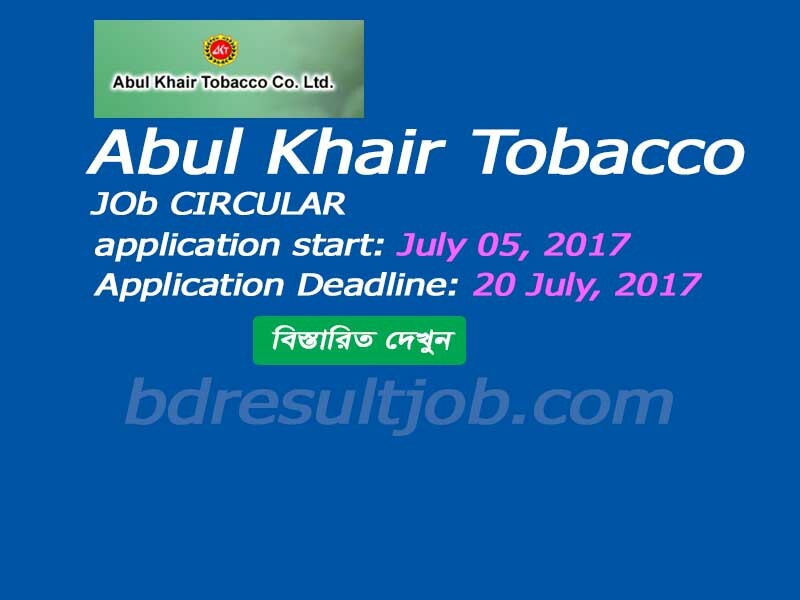 Abul khair tobacco company job circular 2017 has been published. 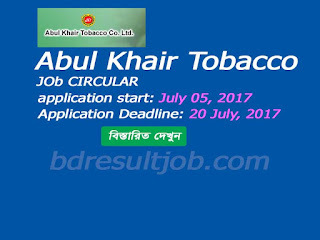 Abul khair tobacco is one of the largest company in Bangladesh. You can build your career in Abul Khair Group. a. Masters in any discipline from any Public University. Freshers are encouraged to apply. b. No 3rd class/Division or equivalent CGPA will be accepted in any examination. a. Age not exceeding 32 years on 20th July, 2017.
b. Must have sound physical health with hight at leat 5'5". Starting Salay will be Tk. 30,000 with other benifits as per company policy. c. Enhance excellent trade relation with different traders and customers. e. Forecast market demand and achieve sales target. f. Ensure sustainable growth of own market share. a. Excellent interpersonal skills to work in a team environment. c. Willingness to take responsibilities and challenges with commitment and honesty. d. Self-driven, result oriented, hard working and willing to work anywhere in the country. e. Positive mental attitude to work in sales and marketing of Cigarette, Bidi & Match. f. Able to ride motorbike. b. Performance based career progression. Interested candidate who confident to fulfill aforesaid criteria 3 way can apply.